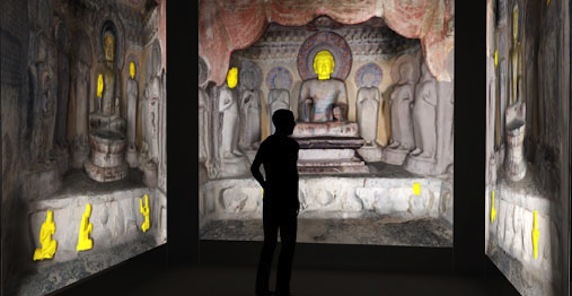 The exhibition was organized by the Smart Museum of Art, University of Chicago, and the Arthur M. Sackler Gallery, Smithsonian Institution. Major funding was provided by the National Endowment for the Humanities, the Leon Levy Foundation, the Smart Family Foundation, and the E. Rhodes and Leona B. Carpenter Foundation. The catalogue was made possible by Fred Eychaner and Tommy Yang Guo, with additional support from Furthermore: a program of the J. M. Kaplan Fund. Additional support for the Smart Museum of Art's presentation was generously provided by the National Endowment for the Arts, the University of Chicago Women's Board, and Helen Zell. Additional support for the Arthur M. Sackler Gallery presentation was provided by the Cotsen Foundation for Academic Research. The Digital Cave was produced and directed by Jason Salavon, with assistance from Travis Saul, 3-D graphics and animation. Video by Hutomo Wicaksono. Arthur M. Sackler Gallery, Smithsonian Institution, Washington, D.C.